For too long (wayyyy too long! ), Poland was off our radar. After visiting Warsaw in early spring and seeing firsthand how incredible the country is, we surmised that Poland just might be the most underrated country in Europe. Eager to return, Krakow shot to the top of our list, so we planned a visit in December to coincide with the famous Krakow Christmas Market. 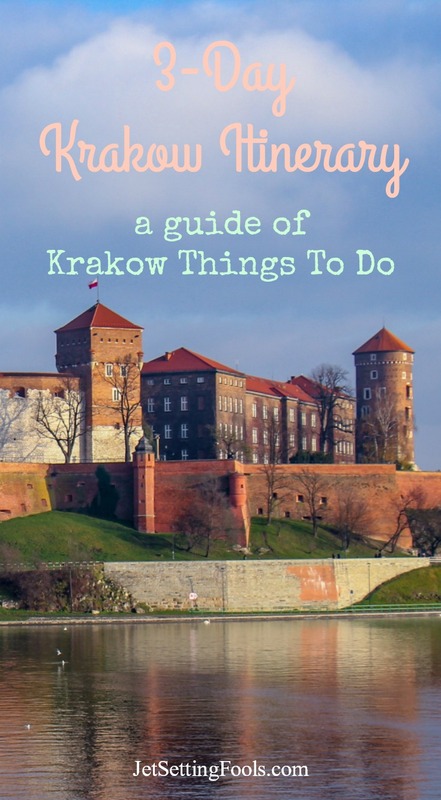 During our time in the city, we filled our days with the top Krakow things to do and discovered a few gems along the way. 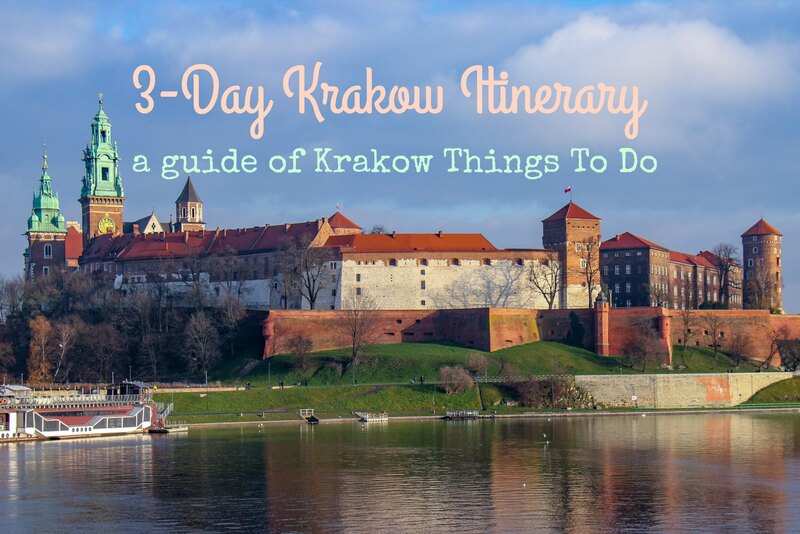 Our 3-Day Krakow Itinerary can be used as a day-by-day guide or simply to help plan Krakow trips! 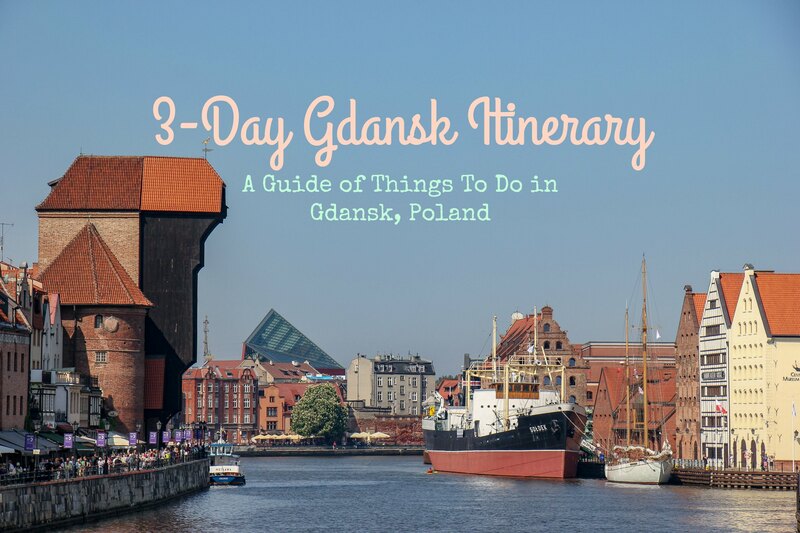 Our itinerary includes all the details of what to do in Krakow in 3 days – including introductions to each sight, links to more information and a link to the sights on Google Maps. 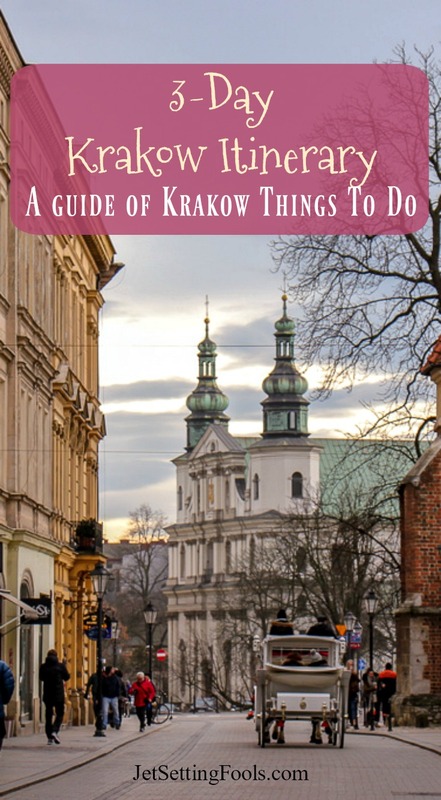 At the end of the post, you will find tips about where to stay in Krakow and other advice to help plan your Poland trip itinerary. On Day 1 of your 3 days in Krakow, get the lay of the land by exploring the Krakow sights on foot – then spend the evening in the hip Tytano district. Google Maps link of walking directions to places to visit in Krakow on Day 1. Start your city exploration in the Krakow Old Town – a UNESCO World Heritage Site since 1978. Follow our outline for a self-guided Krakow walking tour or join one of the Krakow sightseeing tours (suggested tours at end of post). Built in 1498, the brick Krakow Barbican was once part of the city’s defensive walls and a checkpoint for entry into the town via St. Florian’s Gate. The St. Florian’s Gate tower stands at 110-feet and dates to the 14th century. The royal coronation route through the city began at the Barbican, traveled through St. Florian’s Gate down to the main square then continued south to the Wawel Castle. A stroll down Ulica Florianska (St. Florian’s Street) leads directly into the Krakow Main Market Square – one of the largest medieval squares in all of Europe. On the square are some of the city’s most historic sights. Link to Google Maps for sights on the Main Square. St. Mary’s Basilica: Rising above the Main Market Square are the mis-matched towers of St. Mary’s Basilica. The Polish Gothic, red-brick church dates to the 13th century and is a Krakow must-see. The wooden-carved altarpiece (circa the 15th century) is a national treasure of Poland. Plan to be within sight of the church tower at the top of the hour to hear the Hejnal and catch a glimpse of the famous trumpet player as he plays the Krakow Anthem from the open window. Tip: A ticket is required to climb the tower – and only a few people are allowed to climb it per hour – so purchase in advance if going to the top is on your list of Krakow things to do. A ticket is also needed to enter the church to take photos. If you would simply like to enter to pray – and take a look around from the back of the church, you can enter through the door facing the square. St. Adalbert’s Church: The modest stone St. Adalbert’s Church sits on the Main Market Square south of St. Mary’s and was the church where traders would go to pray. The church has a 1,000-year-long history – the original entrance is now several feet below street level (as the the city streets have been raised up around it). Town Hall Tower: The 230-foot-tall Town Hall Tower is all that remains of the Krakow Town Hall (the rest of the building was torn down in 1820), but perhaps the most interesting fact about the tower is that it leans 55cm, earning its nickname, “The Leaning Tower of Krakow.” The basement of the tower was once a prison and torture chamber. Eros Bendato: Displayed next to the Town Hall Tower is the Eros Bendato bronze statue, also called “The Head.” Part of an art exhibition from 2003, “The Head” was gifted to the city and is one of the more modern Krakow tourist attractions in the Old Town. Krakow Cloth Hall: At the center of the square is the iconic Krakow Cloth Hall – a long, covered hall lined with trading booths that dates to the 1300s (with significant overhauls through the years). Goods, like spices and wax, were brought from the east and exchanged for local products, like textiles and salt from the mine. Today, the shops sell traditional wares to tourists. Rynek Underground: Below the Cloth Hall is the Rynek Underground – a fascinating museum detailing the history of the market and lengthy history of the city of Krakow. Opened in 2010, the museum incorporates the original excavated merchant stalls into hi-tech displays. Tip: Admission is free on Tuesdays. From the outside, the St. Francis of Assisi Church looks like just another church – and one of the many in Krakow. However, there are two good reasons to go inside: 1) The Art Nouveau interior is stunningly beautiful (and somewhat unexpected!) and 2) It was the daily place of worship for Pope John Paul II when he served as Bishop and Cardinal in Krakow for 20 years before becoming Pope. Tip: Find the pew at the back of the church marked with a small plaque indicating where Pope John Paul II was often found praying. The Bishop’s Palace, which is just across the street from St. Francis of Assisi Church, has been the Bishop’s residence since the 14th century. After becoming pope, when Pope John Paul II would visit his city, he would stay in the Bishop’s Palace and was known to lean from the upstairs window to give talks (his portrait now hangs in that window). The ornate Baroque Church of St. Peter and Paul – with the 12 Apostles standing on the gate – is beautiful to look at, but it also has two reasons to go inside. First, the church now serves as the National Pantheon celebrating the lives of Poles who have excelled in Arts, Science and Culture. Second, inside is Foucault’s Pendulum, a device that dates to 1851 and proves the rotation of the earth. Tip: Demonstrations of Foucault’s Pendulum take place on Thursdays at 10:00, 11:00 and 12:00. Built between 1079 and 1098, St. Andrew’s Church is one of the oldest buildings in Krakow. The Romanesque church was built to as defensive structure and it survived the attack of the Mongols in 1241. Nicknamed the “Most Beautiful Street in Krakow,” Kanonicza Street is lined with 14th century mansions and palatial residences belonging to the Church. The street leads to the Wawel Castle entrance. At #19 is the former residence of Father Karol Wojtyla (better known as Pope John Paul II), which has been transformed into the Archdiocese Museum. Tip: Use this link for Kanonicza Street for short descriptions of the historic dwellings. Find a place to eat lunch before heading up to Wawel Castle. An Obwarzanek – Krakow’s famous pretzels sold from street vendors – can serve as a snack or light lunch. For something more substantial, consider Restaurant Honey Raspberry (Restauracja Miod Malina) or a quick kebab (our favorites are just a short walk away at U Szwagra 24 map). 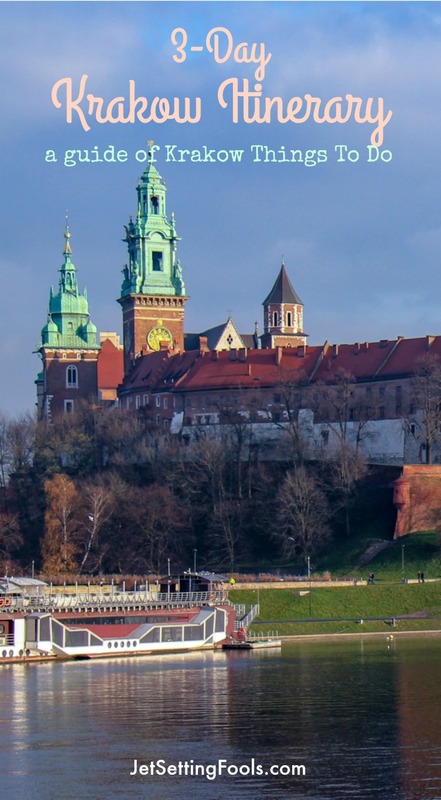 Wawel Castle, which sits atop Wawel Hill, is comprised of several structures situated around a large courtyard – and visiting the castle tops the list of Krakow Things To Do! The hill has been home to civilizations since the Paleolithic Age and there is evidence of a castle on the hill dating to the 11th century. The castle was expanded and destroyed – and changed hands of power – several times throughout history, resulting in an interesting blend of architectural styles (including medieval, Renaissance and Baroque). Today, the castle is a UNESCO Heritage Site and a museum. Entrance to the grounds is free, but tickets are required to visit the State Rooms, Royal Private Apartments, Crown Treasury and Armory, The Lost Wawel (archeological site), Oriental Art, Dragon’s Den and Tower. The Cathedral is free to visit, however, tickets are required for the Royal Tombs, the Sigismund Bell Tower and Cathedral Museum. More information can be found on the Wawel Castle website. Tip: For the best views of the Wawel Castle, walk to the bend in the river and follow the river west to the Debnicki Bridge. The grand white church on the bank of the Vistula River has many names – Church of St. Michael the Archangel and St. Stanislaus Bishop and Martyr and Pauline Fathers Monastery and, simply, Skalka – or Church on the Rock. It has an equally lengthy – and somewhat gripping – story. On the site in 1079, Bishop Stanislaus was executed by order of the Polish King Boleslaw II the Bold. The king fell under a curse and his family built the church as repentance. An altar inside the church hosts the stump on which Stanislaus was dismembered (yes, there is a bloody stump inside the church). Outside, the pool where the Stanislaus statue stands, is where his body parts were tossed; the water is now said to have healing powers, but we can’t personally vouch for that. Beneath the church is a crypt where some of Krakow’s most distinguished citizens are buried. Tytano is Krakow’s reutilization project just west of the Krakow Old Town. The former tobacco factory has been repurposed into a hub of culture and Krakow nightlife – including restaurants, bars and clubs. Touted as a ‘City within a City,’ there is something to satisfy everyone – and each space is creatively designed with an emphasis on local products. We suggest trying the craft beers at Wezze Krafta before or after dinner! On Day 2 of your 3 days in Krakow itinerary, delve into the history of Krakow’s Jews in the Podgorze and Kazimierz Districts. Google Maps link of walking directions to places to visit in Podgorze on Day 2. Google Maps link of walking directions to places to visit in Kazimierz (not including bars) on Day 2. The district of Podgorze – meaning Foothills – has a long and sad past. It was declared an independent city in 1784, but was incorporated into the city of Krakow in the beginning of the 20th century. In March 1941, the Nazis designated the district as the Jewish Ghetto where Krakow’s Jews were forced to live in cramped quarters behind walls until the entire population was liquidated two years later. Located about 2.5 miles south of the Krakow city center is the prehistoric Krakus Mound – the oldest structure in Krakow. Standing at 52-feet, the man-made mound is fabled to be the burial place of King Krakus, the founder of the city. A narrow path winds around the mound, providing an easy way to climb to the top of the mound. From the hilltop, there are 360-degree views of the region. Opened as a limestone quarry in 1873, the earthen pit now lies abandoned. Although Liban Quarry was a successful business, during Nazi occupation, the quarry became a place of forced labor and death. The site was used in the movie Schindler’s List. Now, overgrown and strewn with rusting machinery, the quarry is technically off limits (well, except to the birds and wild creatures that call it home), but that doesn’t stop adventure seekers from entering. We got our first glimpse from the top of Krakus Mound and went to the edge for a closer view, but under wet and muddy conditions, didn’t go any further. Since 1900, Krakow citizens have been buried at the New Podgorze Cemetery. A stroll in the wooded grounds among the memorials is a peaceful – or creepy – way to spend time in Krakow. St. Joseph’s Church was built in the early 1900s in the Gothic Revival style. The church is the centerpiece of Podgorski Square, a triangular-shaped square in the center of the Podgorze district. The square was once a bustling marketplace and the former Town Hall(s) surround the square (buildings #14 and #1). On the northeastern tip of the square is where a Jewish Ghetto gate once stood. Poland’s Milk Bars serve up cheap, Polish comfort food with a side of nostalgia. The cafeteria-style restaurants were popular during Soviet occupation when meat was rationed and restaurants were considered ‘capitalistic.’ The surviving Milk Bars provide a glimpse into the past and a taste of local cuisine – all for just a couple bucks. Milk Bar South (Bar Mleczny Poludniowy) is on the northwestern tip of Podgorski Square and serves all the Polish classics, like pierogis, schabowy (fried pork chop) and kraut, but with patient, English-speaking staff. Tip: Get there early for lunch as the line will be long, seats will be limited and once the pierogis are gone for the day, they don’t make more! There are two places in Podgorze where portions of the Ghetto Wall remain standing as a reminder of the horrors that took place in the district. The wall fragment on Lwowski Street (next to #29) has a plaque that reads, “Here they lived, suffered and died at the hands of the German torturers. From here they began their final journey to the death camps.” A second wall fragment can be found in a somewhat unusual place: in a playground behind a school (go through the gate to the left of the school building at #62 Boleslawa Limanowskiego). Link to Google Maps of Ghetto Wall Fragments. Opened in 2010, the Schindler’s Factory Museum details life in Krakow during Nazi Occupation in the years 1939 to 1945. The museum is housed in the original factory owned by Nazi Oskar Schindler, a man who is credited with saving 1,200 Jews during the Holocaust by employing them. His story is detailed in the book, Schindler’s Ark, and subsequent movie, Schindler’s List. In 1941, Ghetto Heroes Square was at the heart of the Jewish Ghetto. After Nazi occupation, the former Little Market Square was renamed and, in 2005, the Empty Chairs Memorial was erected in honor of the Jews who died. The monument of 70 illuminated chairs covers the entire square. The chairs are said to be a symbol of both the furniture that was left behind when the Jews were ushered to the Concentration Camps, as well as the missing people who would be sitting in those chairs had they not been killed. On the south side of the square is the Pharmacy Under the Eagle Museum. In 1941, the owner of the pharmacy, a non-Jew – and the only non-Jew working in the Ghetto, kept his shop running and aided the Jews not only with medicine but with fake documents. Before leaving Podgorze, stop at Miejscowka for a coffee, craft beer or sandwich. The board shop/pub has a chill vibe and friendly staff. We took their recommendations and filled a sampler paddleboard of craft beer. The Bernatek Bridge connects the districts of Podgorze and Kazimierz. Built in 2010, the modern bridge features acrobatic figures on the cables and can be used by pedestrians and cyclists to cross the Vistula River. Before the Jews were forcibly moved into the Krakow Jewish Ghetto in 1941, many Jews resided in Kazimierz, a district that is known as the Jewish Quarter. Even though much of the area was destroyed during Nazi occupation (and what wasn’t was left to ruins in the years after the war), the district has retained much of its Jewish history and culture. Plac Nowy, sometimes referred to as the Jewish Square, is the market square in Kazimierz. Although it is slightly run down and fairly small for a market square, it remains a popular gathering place. Market booths stand on the perimeter, while a large rotunda takes up the center of the square. The round building, which was originally used as a chicken slaughterhouse, has several windows from which zapiekanka (a pizza baguette) is sold. Each vendor offers their own unique combination of toppings – and they are all cheap and filling, making for a great snack or dinner-on-the-go. The Old Synagogue, built in the 1400s, still stands today and has been transformed into a museum. Remah and Poppera are two other synagogues on Szeroka. The Old Jewish Cemetery, next to Remah Synagogue, was established in the 1500s and is the burial grounds of many famous Jews from Krakow (although, Nazis destroyed much of the cemetery during occupation). Some Jewish shops on Szeroka Street have been revitalized in recent years. Not only is Kazimierz stocked with history, it is also home to an incredible number of bars. Two of the districts most popular bars can be found on Plac Nowy: Alchemia (a dimly-lit throwback bar) and Pijalnia Wodki I Piwa (a stark, light-filled bar open 22 hours a day with cheap, basic beer, vodka and snacks). For craft beer, seek out Ursa Maior and Omerta Pub. For a taste of vodka with a more mellow atmosphere, try Trojkat. Google Map of bar locations. Before ending the night, detour to Kielbaski I Niebieskiej Nyski, a kielbasa food truck that has been operating for 25 years. 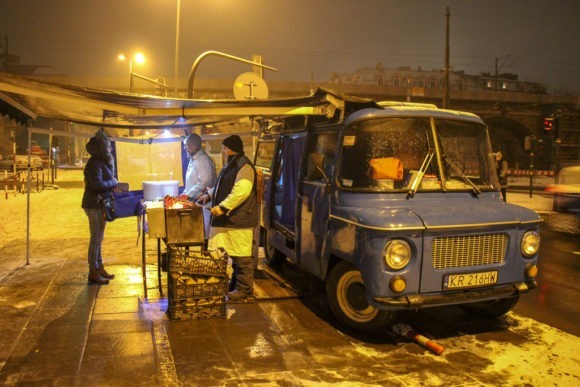 The two-man team grills up sausages over a wood fire from the side of the soviet-era van for late-night revelers. The sausages come on a roll and cost 8 zloty ($2.25 USD) and are delicious. Tip: If you are spending a long weekend in Krakow, be aware the truck is closed on Sundays! On Day 3 of your three days in Krakow, take two half-day trips outside Krakow: to the salt mine and then explore the socialist-realist Nowa Huta neighborhood – then spend your last night in the Krakow Old Town. Google Maps link of Krakow sights on Day 3. The Wieliczka Salt Mine dates to the 13th century and was continuously used to mine table salt until 2007. Today, visiting the mine is one of the most popular Krakow day trips. There are a number of guided tours (in several languages), as well as a health spa. The Tourist Route takes visitors down 800 steps into the mine and traverses multiple corridors that tell the history of the mine. Throughout the mine there are statues of Poland’s most famous residents – all made of rock salt – as well as four chapels. The most impressive chapel, St. Kinga’s Chapel, is a cavernous space complete with bible stories carved along the walls – and an altar and chandeliers…all made of rock salt. Visiting the Wieliczka Salt Mine is one of the top things to do in Krakow, Poland. Tip: Many Krakow Tours offer trips to the Wieliczka Salt Mine (you can check them out on Viator), but we organized the trip on our own using the train. Nowa Huta – in Krakow’s eastern district – is chockablock full of socialist realist architecture. Built in 1949 under Soviet occupation, the district was designed to be a perfect city with wide streets and green parks….as well as a lot of factories and apartment blocks. Nowa Huta was built quickly – and poorly – and much of the grandeur of the neighborhood was never realized. The factories, however, were thriving within years, churning out steel, cement and tobacco. Today, Nowa Huta is a whole heap of concrete, but has ditched ties to Stalin by renaming streets and squares in honor of those opposed to the communist regime. The Central Square, which at one time hosted an enormous statue of Stalin, is now called Ronald Reagan Central Square. Tip: Eat lunch at Stylowa, once the classiest joint in Nowa Huta that has changed little through the years. On short trips to Krakow, it can be easy to get caught up in the sights, when in actuality, the entire Krakow Old Town is a sight that shouldn’t be missed! Wander the streets and get lost in the cobblestone lanes. When you get hungry, find Miod I Wino for a traditional meal of pierogis, placki (Polish potato pancakes) and hearty meat dishes. Or for something a little less formal (but just as filling), opt for Przypiecek 24h – an 24/7 pierogi shop next door. Get a taste of Krakow’s buzzing craft beer scene at one of the many multitaps. Our top suggestions for Craft Beer in Krakow’s Old Town are: Multi Qlti Tap, Viva La Pinta, House of Beer, Wielochmiel and Relaks Craft. Interested in Polish vodka? You can get that at the craft beer bars, too. Cheers…or Twoje Zdrowie, as they say in Poland! Google Map of Krakow Old Town Craft Beer Bar Locations. In our 3-Day Krakow Itinerary, we included information on day trips from Krakow to the Wieliczka Salt Mine and Nowa Huta district. Both of those Krakow day trips can be done using public transportation – or with an organized tour group. There are many museums in Krakow for tourists to visit during their stay. Several museums offer a limited number of tickets each day, so book ahead if you can. Also, check in advance for free museum days in Krakow! 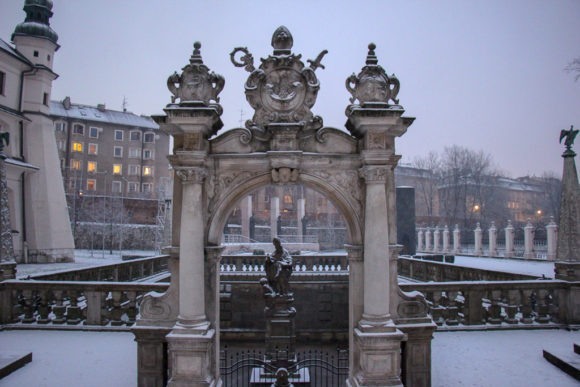 A list of Krakow History Museums can be found here. A list of Krakow Art Museums can be found here. We planned our Krakow trip during December so that we could partake in the Krakow Christmas Market. The festive vibe certainly got us in the holiday spirit! There are many Krakow events throughout the year, which you can find on this calendar. Is Warsaw part of your Poland travel itinerary? 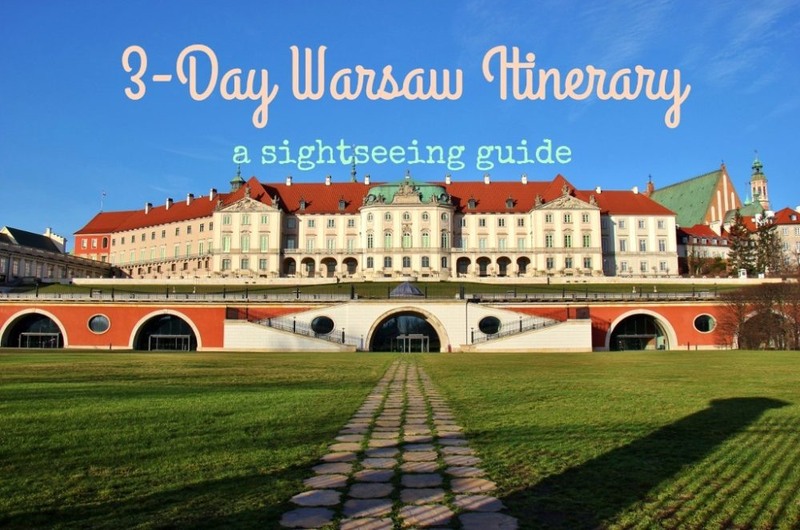 Take a look at our 3-Day Warsaw Itinerary to help plan your time in Poland’s capital city! During our visit to Krakow, we stayed in this awesome Airbnb Apartment, which had a partial view of the Wawel Castle. (Not already a member of Airbnb? Use this link to create an account and save money on your first stay!) We have found that staying in apartments is often less expensive than hotel rooms – with the added benefit of a kitchen and, usually, more space. Krakow holiday apartments can also be searched on FlipKey (which is part of TripAdvisor) or on VRBO – Vacation Rentals By Owner. However, for those who prefer staying in traditional accommodations, there are many Krakow hotels to choose from in – or close to – the city center (search now on Booking.com!). Check out these top-rated hotels (based on guest reviews!) for your upcoming trip: Hotel Indigo Krakow Old Town, Queen Boutique Hotel, or Metropolitan Boutique Hotel. Or, find a deal on a hotel room by bidding on Priceline. Budget travelers can search for Krakow Hostels – like Bison Hostel and Mundo Hostel. For a true bargain – and a unique experience – search for hosts on Couchsurfing, where travelers stay with locals for free. Krakow can be reached by plane, train, bus or car. We traveled from Budapest to Krakow (via Kosice, Slovakia) by bus. We departed Krakow via the John Paul II International Airport, which is located outside of the city center. We took an Uber to the airport, however, you can book airport transfers to and from the airport in advance. Our preferred method of getting anywhere is by flying (we are JetSetting Fools, after all!). When we purchase plane tickets, we start our search for the best deals on airline tickets on Skyscanner or Flight Hub. Krakow is a walkable city…but only if you have the right shoes! Don’t forget to pack a pair of lightweight and comfortable walking shoes for your trip. I (Sarah) have traveled with these shoes by Columbia, Skechers and Reef. Kris prefers wearing these shoes by Merrell and Sanuk. It’s easy to get turned around in any foreign city…and especially Krakow! Make sure to have a good city map and/or guidebook before arriving. We want to know: What are your favorite Krakow things to do? 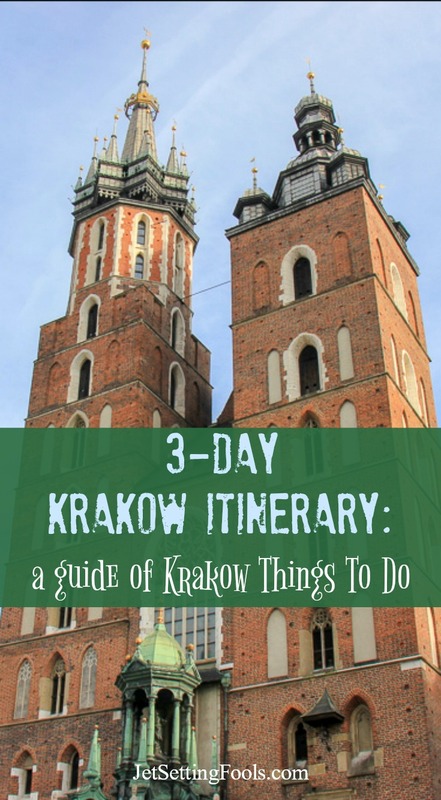 What would you add to our 3-Day Krakow Itinerary? Leave your top tips in the comments below! Start planning your trip to Krakow! Search for the lowest airfares, the best accommodations and fun things to do…then start packing! Want more travel planning tips? Head over to our Travel Planning page for more information and tips on traveling – and for country-specific information, take a look at our Travel Guides page! This entry was posted in Itinerary/Sights, Poland, Travel. Bookmark the permalink. Thanks so much for this super exhaustive list of things to do in Krakow, I’m traveling there for the first time in a few weeks, your guide is going to be so helpful. Cheers! You’re very welcome! Travel well and enjoy your visit…. Thank you so much! We hope you will visit Krakow soon! This is such a wonderful post! I only got to see Krakow for one day and absolutely loved it! This post makes me want to go back! Thank you Laura! We hope you make it back soon. Thanks so much Dean! Cheers buddy.